Improved in all the right places, the NP3 provides a very authentic piano playing experience, and the included sample content makes it very hard to beat. Truly excellent keyboard feel with a piano-like response. Excellent included acoustic pianos, EPs and sample library. High-quality onboard effects to add icing to your piano cake. It’s expensive, but quality does cost. Still no pitchbend or mod wheel for controller tasks. The original Nord Piano launched back in 2010, aimed at the discerning piano player wanting access to Nord’s respected Piano Library sounds with premium weighted keyboard action in a portable form-factor. 2012 saw the second edition, adding user sample loading, Nord Sample Library capability and more memory. we reckon they’ll be less roadworthy long-term compared to their predecessors. The lovely OLED display and menu system first found on the NE5 (and also on the just-announced NS3) has now made its way to the NP3, making for a big improvement over the old monochrome LCD display. There’s still no pitchbend or mod wheel, though, which would significantly improve the NP3’s MIDI controller abilities, and performance while using the Sample Synth section. Digital pianos live or die by their keyboards’ actions, and the Piano 3’s is probably the finest we’ve played on a digital keyboard. The keys feel great and respond to every nuance your fingers can imagine! There’s enough weight for those who like heavier actions, but not too much to be detrimental to any onboard instruments that require a lighter touch. The new Triple-Sensor keybed and ‘Nord Virtual Hammer Action’ technology combine to enable more piano-like playing, and you can retrigger sounds and repeats from halfway down the keys’ travel without having to fully release your fingers. Add in the included Triple Pedal, which can trigger sympathetic resonance samples and sostenuto, and you can’t fail to be impressed by the all-round authentic piano-like experience on offer. Of course, none of this would matter if the available piano sounds weren’t top-notch, and we still rate Nord’s free Piano Library very highly indeed. The acoustics, electrics and clavs are all extremely musical (though us Nord users are still holding out for more nuanced Rhodes and muted clav samples). If you want an authentic warm piano with plenty of character, the Nords have it! There’s an ever-growing choice of pianos available, plus a gigabyte of memory to drop in your favourites. The Sample Synth section has also been improved with double the memory, there’s LED indication for your split points, ‘deep’ modes for the authentic modulation effects, and pedal control for effect block 1 (wah, pan, trem). 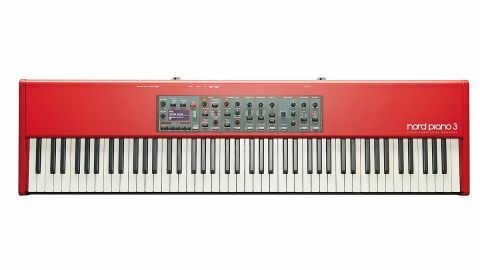 As always with Nord, it’s evolution not revolution, but as far as authentic-feeling and -sounding stage pianos go, the NP3 is very hard to beat.